I think that this drawing is done. I've let it sit for a week while I looked at it. I made some minor changes, the main one being the addition of darker gray/browns to the upper part of the drawing so that it wouldn't be misread as sky. As I've looked at it I realized that it isn't as much about color as I'd thought. Like most of my work, abstract or realistic, shape is very important. I'm not sure why I didn't realize that about this drawing. Now that it's done I see how much the tree limbs stand out. Perhaps because they are fairly realistic, and not based too much on my imagination, I just didn't think about them playing an important part in the 'art' of the drawing that I mentioned in an earlier post. But they do. As I've looked at my other work over the last week I realize that most of it involves a love of drawing, especially drawing in the sense of carving an object out of the flat dimension of paper or canvas. Sometimes those shapes are realistic, and strive to capture the contours of what I see. At other times they are abstract and more concerned with carving a new object from nothing. In both cases they generally show some of the process involved. Showing the process involved in a work of art is a 20th century art convention. In the eyes of some most conventions eventually seem to be cliches. The most noticeable example of this I think is the gratuitous painterly drip. Nonetheless it is MY convention. I don't feel right hiding all aspects of the act of illusion creation that is the basis of most representational art. So if someone might wonder why I might not do smoother, more finished drawings, especially as I create the shapes, this is why. I just don't like too much smoothness and the hiding of the process of creating the illusion. For me there is some work involved in getting shapes right. I like to let some of that work show. I realize this is a convention. It does not in itself create better art. But it's my convention. I enjoyed switching from watercolor to pastel in my last drawing and decided to try it again today. Much more than watercolor it is an additive process, i.e. I can start out without a clear plan of what I'm going to do, knowing that I can improvise as I go along. I don't need to worry as much about using up something, e.g. the white of the paper, and then needing to get it back later. 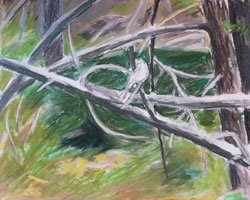 Though it's possible to use the clear white of the paper thoughtlessly, just as in watercolor, it is easier to get it back to some degree through the use of white pastel. Since pastel is itself opaque, the addition of another layer of opaque white is not as noticeable as it is in watercolor. Or better, it doesn't seem as bothersome. 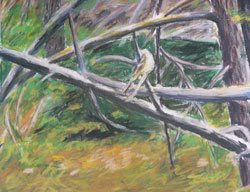 This drawing is based on photos of an Acadian Flycatcher taken in Shenandoah National Park in May, 2008. 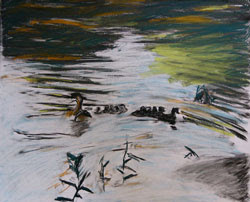 The bird is even more distant than were the Wood Ducks in my last drawing and posting. Because of that I knew that any work based on it was going to have to devote a lot of space to the surrounding forest, with very little devoted to the flycatcher itself. I didn't do much in the way of a preliminary drawing. 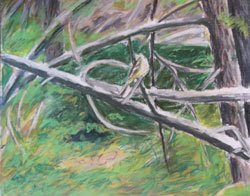 If I had done so it would have focused on the tree limbs and foliage and not on the flycatcher, since he is so small. At the same time I had to do something with him so that he was the focus of the painting. This might have been somewhat easier in watercolor and pen/pencil since I could use the line of the pen or pencil to add some small detail. 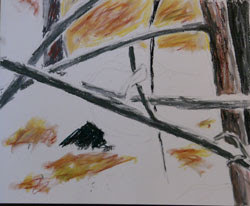 But detail with the broad edge of a pastel is not so easy. Basically pastel doesn't allow detail. 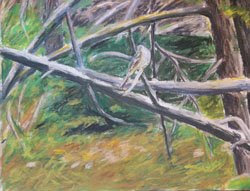 So my idea here was to start laying in color, knowing that there would probably be numerous changes as I tried to unify the drawing coloristically, remain true to some extent to the sense of the deep forest that is often the home of the Acadian Flycatcher, and make sure that he still stood out from the surrounding jungle of limbs and leaves. The drawing so far has some sense of the deep forest, but the Flycatcher is a bit lost. 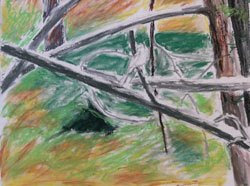 And the upper part of the drawing reads like it might be sky when in fact it is just a deeper part of the forest. I may need to change the colors to remedy that. Still I think I've kept some of the sense of the way in which he sat and tilted his head. The colors may also have gotten a bit too monotonous, though that in fact is what they actually were. It's time to leave it be for now and come back another day. So What Is this 'Art'? In my last post I mentioned rescuing a drawing/painting that didn't include significant, realistic detail with 'art.' This was said half facetiously and half seriously. It could sound like I was saying that a work without significant detail was somehow lacking and needed 'art' to make it as presentable as a more detailed work. Many people think this, and I wouldn't be surprised if most people who like 'wildlife art' think in this way. So 'art' is something 'artful'? Perfectly clear. Well I suppose not. Let me just say that I thought that I could do something with this subject that would end up both giving some sense of what the scene was like as I saw it and allowing me to use color, gesture and shape in such a way that I was pleased with the overall visual impression. It began as a strictly charcoal drawing. It is possible to use tonal variety in black and white drawings to create something just as colorful as a work in color. But I didn't feel that was happening so I decided to add pastel on top of the black charcoal. 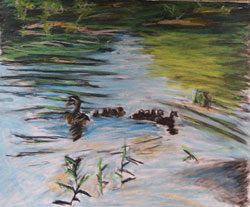 This was my first use of pastel in a realistic work in many, many years. As the work developed, and reading from top to bottom here, I added some color here, removed some there, erased more here, etc. The intent was both to create something whose colors worked together to create something vibrant and to remain true, at least to a large extent, to what I had originally seen. 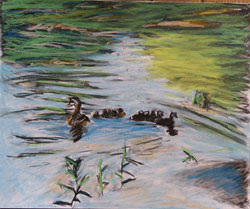 In particular I wanted to preserve the sense of a Wood Duck and ducklings in water. As I worked on it, it was the rearrangement of color, more than anything that I kept changing. That was the driving force in continuing to work on it. And in this case I think it was the most important aspect of the 'art.' In other drawings it may be shape, or mark, or design, or numerous other things. All of them make up 'art', and for me they are the most important part of drawing and painting. The difference in my nsturalistic art is that I also want to remain true, to some large degree, to what I originally saw.